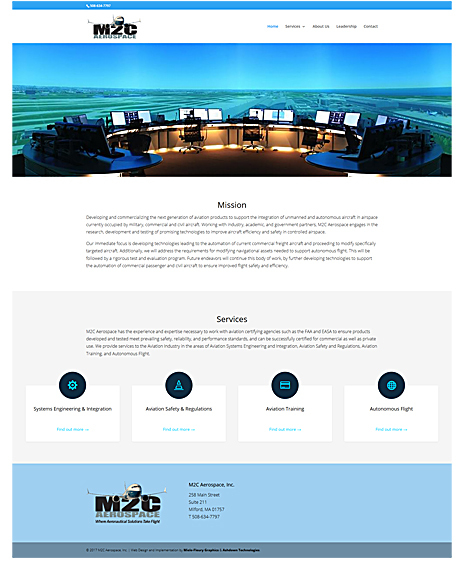 M2C Aerospace wanted a new web site to feature their services in the areas of Systems Engineering & Integration, Aviation Safety & Regulations, Aviation Training, and Autonomous Flight. They’re a Massachusetts woman-owned aviation business with deep expertise in the airline industry and in aviation safety and operations. The company works with government, industry, and academia to promote and assume a leadership role in the new frontier of aviation. This includes the development of products and services related to autonomous flight with high potential to support improvements in aviation safety and efficiency. Visit the M2C Aerospace, Inc. web site.